Solar Fountain Pump, 1.4W Free Standing Water Fountain Pump Kit with 4 Different Spray Heads for Bird Bath, Fish Tank, Small Pond and Garden | Fountain City Art Ctr. 5. Maximum delivery height: 18", Regular:10~15"
New upgrade： It is an extremely competent solar panel. It is controlled with solar power completely. It does not need battery or electricity. Sprayer for Different Water Style:The package contains four different spray heads, each with a different spray head. You can easily replace the nozzle. This is a floating fountain pump, but if you do not want it to float anywhere, you can also use a suction cup to fix the pump. 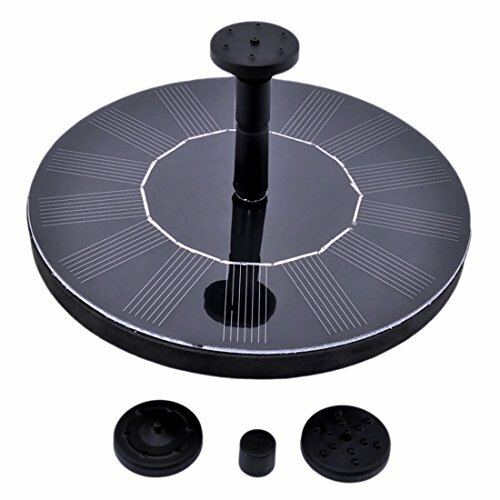 Multifunctional application:This fountain is suitable for bird baths, fish tanks, small ponds, swimming pools, gardens, your garden will definitely attract the attention of passers-by. Make your yard look so interesting,this fountain can inflate water and keep the water circulating. Safe and simple installation:No extra screws and no plug required. There is no need for a power outlet or battery, all you have to do is let the pump float on the water. Once the solar panel receives sunlight, it will automatically operate in a few seconds. It accepts that the brighter the sun, the better the effect. Recommendations and cautions: Make sure there is enough water in the fountain so that the pump can be completely underwater. Avoid pump clogging with dust and you should clean the pump regularly.